Last Sunday morning I woke up feeling pretty nervous for what seemed like no reason until I remembered the next day – Monday February 11, 2019 – was budget day. Not only that, I was considering reigniting an earlier conversation council had about one of the budget items. I wanted us to have more of a discussion about the merits and challenges of the proposed corporate branding review. It’s one thing to join into a conversation someone else starts. It felt like a whole other thing to initiate a conversation that might see a budget item removed or deferred. I see the merits of a corporate branding review and value that department, its staff, and the work they do, but was uncomfortable with the price tag and timing. First of all, I want to mention how much time, effort, and skill staff put into preparing the budget and answering several questions many of us asked over the last few months. I am also grateful for my fellow councillors who thoughtfully and respectfully debated and, at times, disagreed with one another. A 2.2 % tax increase amounting to $28.11 for the average household was approved. Adding city utilities (city portion at 2.4% and Region portion at 2.0%) the total average household impact is $72.55. The Waterloo Memorial Recreation Complex (WMRC) expansion and repurposing was approved. Budget was put towards Parkview Cemetery, located in Ward 5, for maintenance and to add more niche space - glass cases where one’s cremated remains and sometimes other personal items can be memorialized. Substantial investment was approved for road reconstruction and repaving throughout the city. The Waterloo Public Library got some love with the approval for funds to build an east side branch. An east side library addresses a gap in library service for that part of the city. Investment into staff positions such as a Data Management Analyst and Fleet Parts and Service Specialist to support staff on the front lines, and to create more effective and efficient processes. Council has asked staff to investigate how to move up construction of an elevator in the button factory to improve access to this central community arts space. Leaf collection and uptown parking generated a lot of discussion amongst council as well. I think you can expect more conversations about these two items in the future. What’s next now that the 2019 budget process is complete? First up is the strategic plan process. 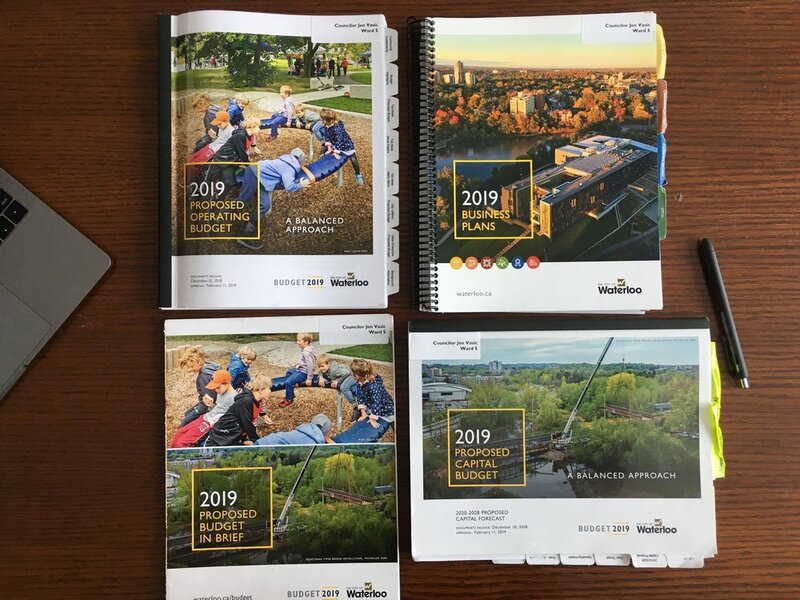 Community, staff, and council input will help inform the new strategic plan which will in turn help to determine the 2020-2022 budget priorities. Please take some time to have your say by contacting the people listed on this survey, emailing me at jen.vasic@waterloo, or calling (519) 635-9436.